Aaron Kraiman poses with his Maryland flag. Aaron Kraiman/Mitzpeh. “The Maryland man takes after his purple-haired grandmother,” said Aaron Kraiman. The senior kinesiology major is known around campus for three things: “Maryland, Biking, and Judaism” according to Amir Wertheimer, a junior architecture major. Others know him as a surfer, lifeguard, and lifting enthusiast, who brings good vibes and energy wherever he goes. Every Shabbat, he dons a unique outfit of Maryland clothing, and introduces himself to every freshman present at the evening service. Even when he is not dressed in Maryland apparel, he always has a Maryland Terps themed yarmulke on. He credits that yarmulke to how his reputation started. “I came right up to these steps [to Hillel], I got the Maryland flag yarmulke and my Maryland pride just took off” Kraiman said. He wore it everywhere during his Freshman year and people started to notice. As the only lifeguard to wear a yarmulke to work, his coworkers at the YMCA in Silver Spring at the time loved it. However, Kraiman said that freshman year was “rocky.” In fact, he didn’t even like college until his second semester, when he got into a groove and started to get involved around campus. He checked out MEOR, Chabad, Hillel, and went to various events, steadily becoming a familiar and friendly face. 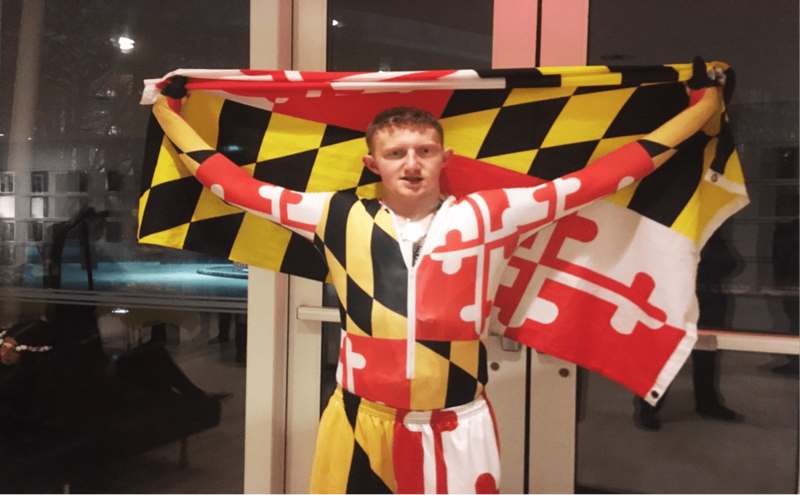 The summer after freshman year, he started to buy more Maryland apparel to wear to the YMCA, and with the praise he received there, he started wearing his pride around campus. He bought a new article of Maryland clothing every week to wear to Shabbat evening services. He also began to reach out to incoming freshman and visitors to make them feel welcome. Kraiman says he is not the only one in the family with a “high profile.” He takes after his grandmother in Portland Oregon, who is the only Jew in the town with purple hair. Though he loves the publicity as “The Maryland Kid,” Kraiman eventually wants to become a physical therapist after graduation. He has always been interested in fitness as a surfer, biker, lifter and swimmer. His interest in becoming a therapist began while he was an athlete in high school. Kraiman used to run on a track team. He even competed in a half marathon in 2013. But he said he kept developing the same stress injuries, which is why he bikes a lot today. Now, he wants to help others prevent the injuries he had and help them achieve their fitness goals. Rabbi Eli Backman, director of Maryland Chabad, says Kraiman has had a great impact on the Jewish and general community through his personality. No Replies to "Jew You Should Know: Aaron Kraiman"